Activist groups from the Glasgow Against the Arms Fair campaign held a rally on Saturday the 23rd of June at the Buchanan Street Steps. The event included a number of speakers who raised awareness against the three-day UDT Arms Fair in Glasgow at the SEC, initiative that has drawn widespread condemnation and is backed by the Council. Jay Sutherland of Scotland Against Militarism told Bella Caledonia that Scotland Against Militarism has been working on building an effective opposition to the Arms Fair along with others in the coalition ever since they heard it was going to be held in Glasgow. Their campaign has been targeted at Glasgow City Council in particular, because despite them removing their ‘People Make Glasgow’ logo from the conference they still have not removed their practical support of the event. The speakers included members of peace organisations such as the Campaign Against Arms Trade, the Campaign for Nuclear Disarmament, Scotland Against Militarism and the Scottish Peace Network. They were joined by other social movement groups such as the Scottish Palestine Solidarity Campaign, Unison, the Greens, the University and College Union, Action for Scotland,and the Common Good Awareness. The event included a die-in where participants had blood stained boiler suits to highlight the destructive effects of war. Some anti-war songs were also played. 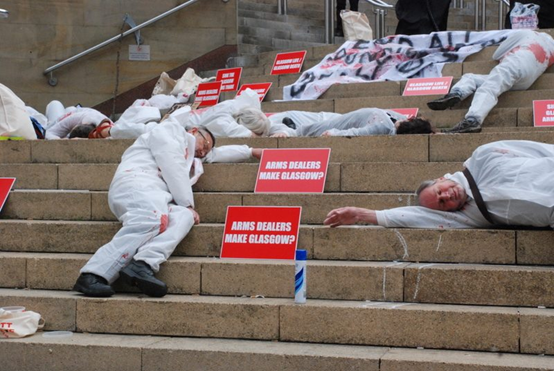 “This has been a youth led campaign with an #ArtsNotArms event taking place on the second day of the Arms Fair and mass postering around Glasgow – this has been led from the grassroots. It had also laid the groundwork to oppose more Militarism in the future in Glasgow and beyond. Even within the first few hours of the event going live on Facebook we had hundreds of people say they are going and we are currently now over a thousand on the event page,” said Mr. Sutherland, of Scotland Against Militarism. The official large-scale rally, organised by the Sink the Arms Fair coalition is taking place from 10am-12pm onwards, outside Glasgow’s SEC at the opening day of the conference. People however will gather from 8am to “welcome the arms dealers to Glasgow with noise and colour”. Other groups supporting the organised opposition include Scottish CND, Scotland Against Militarism, CAAT, Scottish PSC and Food Not Bombs amongst others. Other events will also take place including the Arts not Arms day event on the 27th, organised by Scotland Against Militarism and CAAT Scotland and the NHC Music Words Against War – No Arms Fair In Glasgow on the 28th, the final day of the fair. The latter event is hosted by New Hellfire Club.